Motion sensors can be a lifesaver. They don’t leave you stumbling in the darkness, trying to find a light switch. They don’t even require you know where the switch is located. And not having to touch a light switch has implications for the spread of germs. Depending on if you’re thinking about a home installation or a commercial installation, some of these benefits mean more than others. But with so many knockoffs and junk units on the market, finding the right motion sensor can actually be tricky. Understanding your own unique needs is a good place to begin. Once you’ve done that, you only have to try and avoid unforeseen consequences in your selection. For instance, you’ll need to reflect on the placement of the sensor, how often it will be used, and what kind of devices will be connected with it. In most cases, people use motion sensor plugs (and occupancy sensors) for very simple things, like turning on a couple lights. But with the right plug, it’s actually possible to active a television, radio, teakettle, and so forth. People who are only trying to power a couple of lights will not have to worry about the total wattage supported by their motion sensor plug. But anyone who intends on using larger devices, like a stereo system, will want to ensure the plug is capable of handling greater amounts of current. On the higher end, you’ll typically find support capping out around 360W, at least until you start looking at specialty equipment. Without hard-wired installations, you typically find supported wattage lingering closer to 250W. 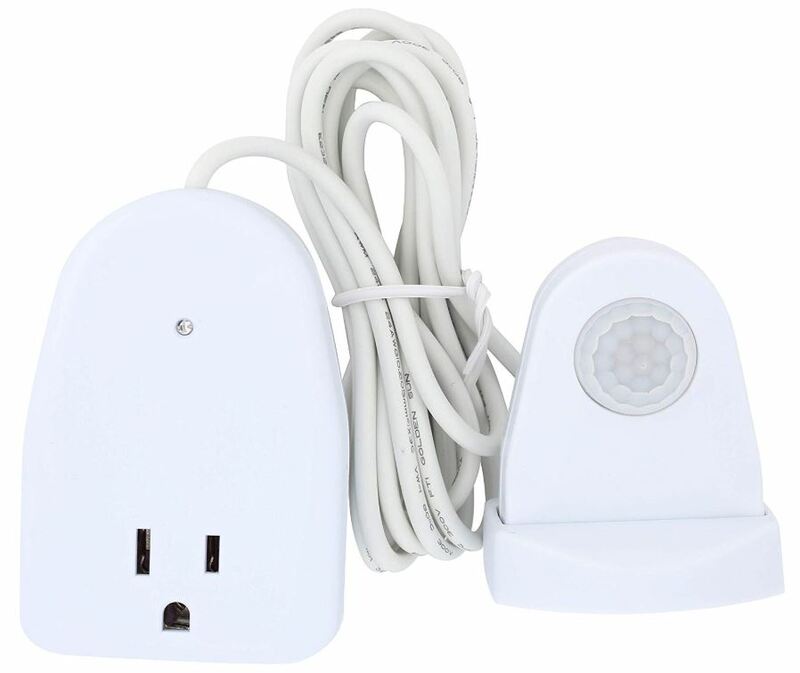 Depending on the device, the sensor may be wired into the outlet, run separately from the outlet, or even connect with the outlet wirelessly. The better wireless outlets on the market are capable of breaching 100ft of connectivity, though the lesser units tend towards 50ft. In order to select the right option, you only need to think about where motion will occur, and where a sensor can be used to capture it. When sensors are built-in to a wall socket, that’s great for avoiding theft, but it’s terrible if the socket isn’t positioned adequately to detect motion. Most sensors will provide a distance of about 30-feet of motion detection. Sometimes sensors are built over-sensitive or a little under-sensitive. It’s usually better for sensors to be slightly under-sensitive. It’s the difference between a switch taking an extra moment to activate, or activating needlessly while nobody is around. 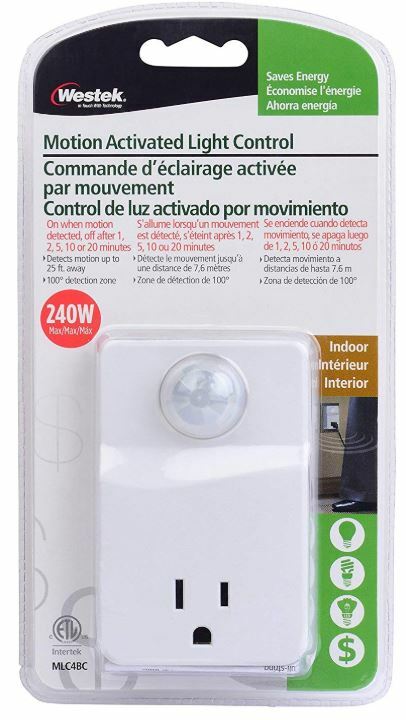 Some motion sensor plugs don’t allow you to adjust the switch timer. How long does everything stay on after the motion has left? If you can’t toggle this, you probably want a higher ceiling, like 10-minutes. If you’re capable of changing this, you might want to set a short 2-minute timer, in the interests of saving power. But having the option to make these adjustments can be critical. Some sensors are literally plug and play. You just shove them into an outlet, and you’re good to go. Other sensors require a proper wall installation to replace an electrical socket. Though none of these different installations should be inherently difficult, some are clearly more difficult than others, and can be made worse if you’re provided with inadequate instruction. When it comes to anything being used as home decor, it’s perfectly fair to consider aesthetic. This is typically a less important consideration when you’re shoving the sensor in a shed or maintenance closet. But more often than not, these products are made from white matte plastic, which is amenable to being painted or recolored. Occasionally they’re composed of more attractive glossy plastics, but those plastics tend to be slightly more difficult to paint. That’s something that you should keep in mind for choosing wall-socket based motion sensor plugs. Another issue to watch out for is blockage. The design of a motion plug can sometimes block other wall sockets. Whether or not this occurs is actually a combination of environmental factors and the device. But some of devices unavoidably block or eliminate the availability of electrical sockets, which is another thing to keep in mind when choosing. It shouldn’t be too surprising that General Electric makes motion sensors and similar lighting equipment. True to form, the GE 12751 will turn on when motion is detected, and the sensor is capable of picking up motion up to 30-feet away. After motion has stopped, ten minutes need to pass before the light will flip off again. Fairly basic, right? Not entirely. Because while the GE 12751 requires more installation than the rest of the options on this list, it also provides much greater support for wattage and amperage. That’s great for someone who’s trying to run more than a couple of lights. The grounded outlet receiver has about the same dimensions as a standard sized outlet switch cover. And installation is standard, and similar to almost any other GE wall socket. However, it’s worth noting that there’s only a single wall plug on the receiver. That can be limiting for people who really need two sockets. You’re limited to 360-watts bulbs running a maximum of 12A, which basically means you can run anything apart from heavy machinery. There’s no additional wiring needed because everything is done wirelessly between the wired receiver and the battery operated motion sensor. The receiver plugs into any standard outlet, and offers a maximum wireless range of about 100-feet between the sensor and the power switch. That makes it ideal for indoor lighting, lamps, and so forth. The 100ft radius is fantastic for using outdoors, but it’s a small shame that GE didn’t bother waterproofing the sensor unit. Though the transmitter isn’t actually waterproofed, it would be possible to shove it inside some kind of transparent enclosure for protection outside. You wouldn’t want to use the receiver outdoors because it’s not waterproofed at all, but with minimal protection, the sensor would be excellent for external use. The Westek MLC4BC combines sensor and outlet into a single device. 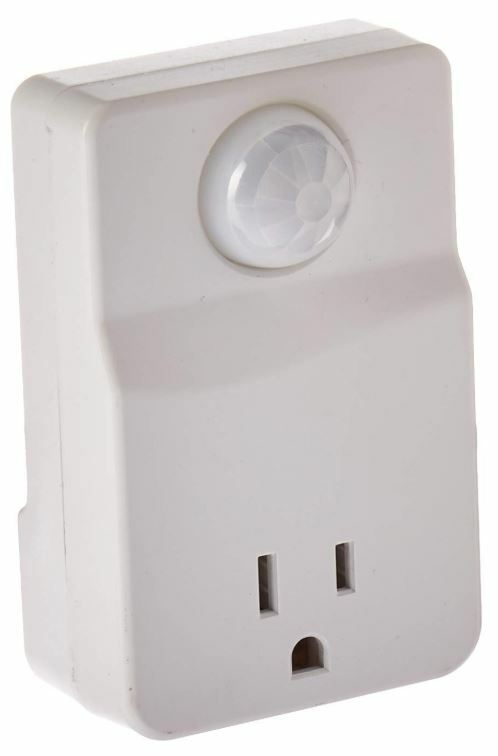 From a positional perspective, this device ensures you can attach the sensor into the top of a wall socket, and not lose access to the bottom socket in the process. From there, the sensor will turn on the lights whenever you enter a room. And the reasonably large sensor is capable of detecting motion in a 100-degree radius, within 25-feet. The MLC4BC measures 3.8 x 2.6 x 0.35 inches, and weighs about two ounces. In terms of décor, the MLC4BC is unfortunately somewhat bland. But the white chassis ought to have no trouble blending into a modern home, nor would it be difficult to recolor with paint if necessary. In terms of installation, the MLC4BC is arguably the easiest option on this list. You just plug it into an existing outlet, and without the need for manually wiring an electrical socket. The downside is that this unit would be incredibly easy to steal if used in an unsecure location. But that’s a downside associated with virtually every portable object that’s easy to setup, isn’t it? The Westek MLC4BC has a couple of extra features working for it, too. For instance, instead of forcing you to use a single timer setting, the automatic shutoff timer can be moved between 1 minutes, 2 minutes, 5 minutes, 10 minutes, and 20 minutes. It’s capable of working with incandescent, CFL, and LED bulbs. Simply plug in a lamp and it will automatically start operating through the sensor, no extra effort or setup is necessary. Because you have fewer options where to position the sensor, you will have think carefully about placement. Using this kind of device will require you to already have a wall outlet which is positioned well for capturing the motion you want to pick up. Because it’s plugged into the wall, it doesn’t require any separate batteries for the sensor. That’s both cost effective and involves less micromanagement. But it also means you can’t actually move or position the sensor. Beyond those limitations and minor complaints, the sensor performs quite well. The motion detection doesn’t rely on light. Day or night, the MLC4BC works equally well. The Westek MLC12BC-4 is a variation on the original MLC4BC. Like the original, the general idea is to eliminate the need to find or use switches. And like the MLC4BC, the automatic shutoff timer can be moved between 1 minutes, 2 minutes, 5 minutes, 10 minutes, and 20 minutes. That kind of versatility is quite useful, for all the reasons discussed above. Similar to the MLC4BC, the sensor has an effective viewing radius of about 100 degrees, and a maximum detection distance of about 25-feet. 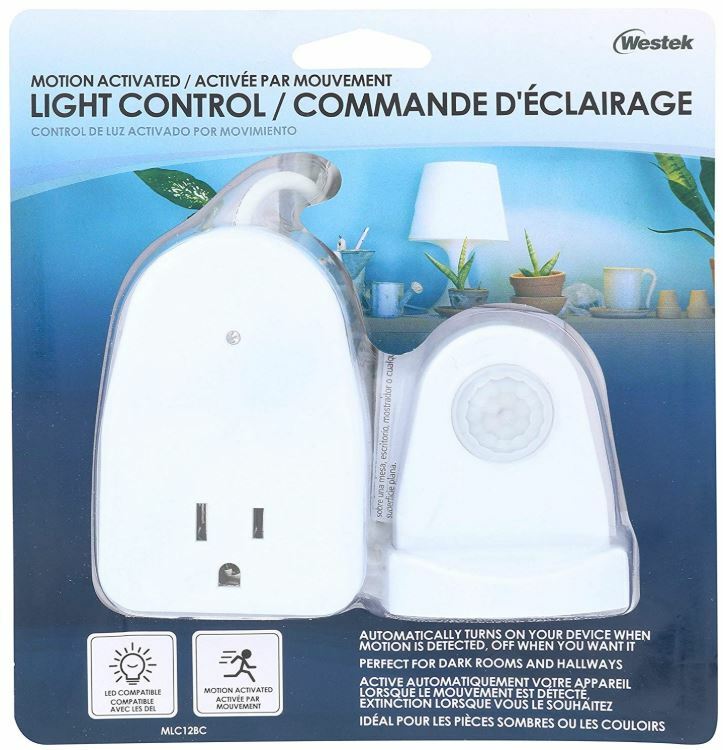 Unlike the MLC4BC, this motion sensor is attached to the outlet through a six-foot cord, which allows the sensor to be placed on shelves, tables, desks, and so forth. The outlet console for the MLC12BC-4 measures roughly 3.8 x 2.6 x 0.35 inches. Aesthetically speaking, the MLC12BC-4 is somewhat more attractive than the MLC4BC, featuring a bright white finish that vaguely resembles the high-end feel of an Apple product. The attached sensor is slightly smaller, measuring about 3” tall, and built around a flat base for easy mounting. There’s a pair of small screw holes on the backside of the sensor unit, you can use it for mounting. Because it hangs on the screw heads, you won’t actually see them. Unfortunately, no mounting equipment is actually included, so you’ll have to provide your own solutions. If you don’t want to work with screws, the sensor is light enough for a simple installation involving double sided tape. It’s compatible with LED, fluorescent, and incandescent bulbs. 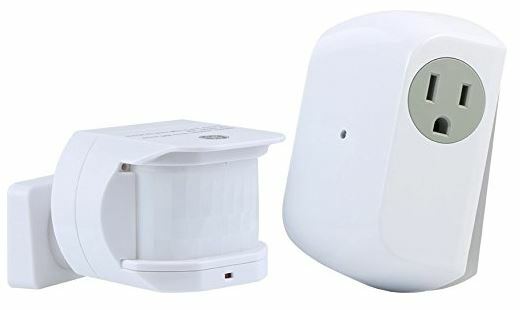 The maximum wattage is 240W, somewhat low, and moderately lower than the current you can carry with the GE motion sensor plug. Nevertheless, most people in most circumstances will be adequately served by 240W. Like with the MLC4BC, the MLC12BC-4 includes a one-year warranty. 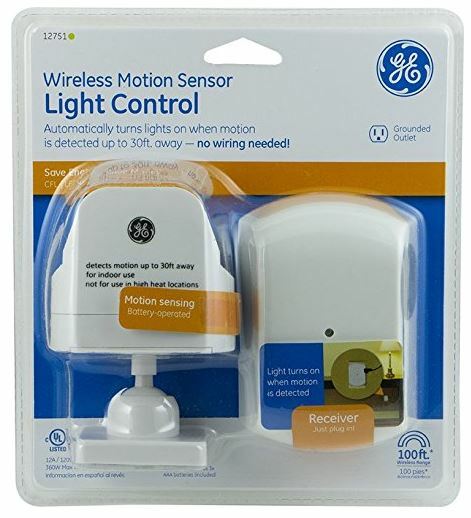 The GE 12751 Wireless Motion-Sensing Light Control Transmitter requires a wall socket installation, which keeps it protected from thieves. Changing electrical wall outlets isn’t really challenging, but it’s challenging enough to be a deterrent to some people. However, as a grounded connection, this sensor is capable of delivering support for more electrical current than any of the other options on this list. Along with the fantastic wireless range, that makes the GE 12751 a great choice for someone who’s interested in using the sensor outdoors, or someone who’s trying to draw a considerable amount of wattage through their plug. The Westek MLC4BC has simplicity going for it. People who don’t need to separate their sensor from the outlet will be able to solve their problems quite easily, and quite inexpensively, too. It’s basically a plug and play device. Anywhere there’s an outlet, you can start using the MLC4BC. Which makes it an excellent choice for someone who knows they’ve got an electrical outlet that is also a good place for the sensor. Similar to the MLC4BC, the MLC12BC-4 uses a fantastically simple plug-and-play installation. Though the Westek MLC12BC-4 is marginally more expensive than the MLC4BC, it’s only because its sensor runs separately along a 6ft cord, which allows better positioning options. That makes the MLC12BC-4 the right choice for someone who doesn’t want to bother with the GE12751’s wall installation, and someone who can’t guarantee they have wall sockets appropriately positioned for a built-in motion sensor.